Harris Web Works offers several levels of managed hosting to accommodate businesses of various sizes, types, and needs. Straight-forward websites, with modest requirements, are run from a shared hosting environment. More complex websites with increased privacy and durability requirements are hosted in a private container. Websites requiring maximum uptime are hosted in private containers residing in multiple geographic regions, providing multi-region failover. All websites are hosted on Amazon Web Services (AWS) infrastructure and benefit from nightly file and database backups. In addition, websites are backed up to the Amazon S3 Cloud a minimum of once per week for disaster recovery. Websites are monitored by Site24x7 in intervals ranging from one to five minutes. Contact us to discuss the best configuration for your business. Websites requiring less resources and durability are typically hosted in a shared hosting environment. This environment is an OpenVZ container running Linux with cPanel Web Hosting Manager. The container server runs the standard packages including MySQL, PHP and Apache. Websites using shared hosting do not receive web traffic filtered through the reverse proxy server. Websites requiring higher levels of durability and privacy are hosted in private OpenVZ containers. Each container is created at the time of website deployment. A standard container configuration involves installation of CentOS, along with MySQL, PHP and Apache. Most dedicated hosting websites have SSL installed and are receiving their web traffic filtered through the reverse proxy server. For maximum uptime and durability, we offer multi-region failover hosting. This is accomplished through a combination of servers located in different geographical regions, a MySQL Galera Database cluster and Amazon’s Route 53 DNS service. See diagram below and AccuStandard project overview here. The system performs a nightly export of all databases associated with your website and stores them on a separate hard drive. An incremental backup of all files is performed nightly and stored on another drive. A nightly copy of the most recent database export is stored offsite in the AWS S3 cloud. 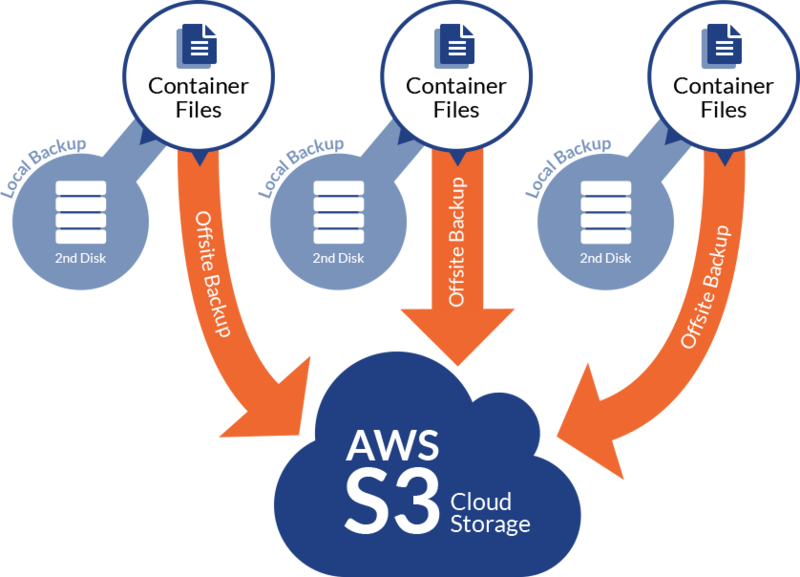 Minimum once per week a compressed archive of your website container is placed in the AWS S3 cloud. This procedure ensures continuity of service in the event of hardware failure, human error, or disaster. This backup process has a few technical considerations. The separate drive used for incremental backups and nightly database exports is accessible only through the server node. Any compromise to the container does not affect this drive. 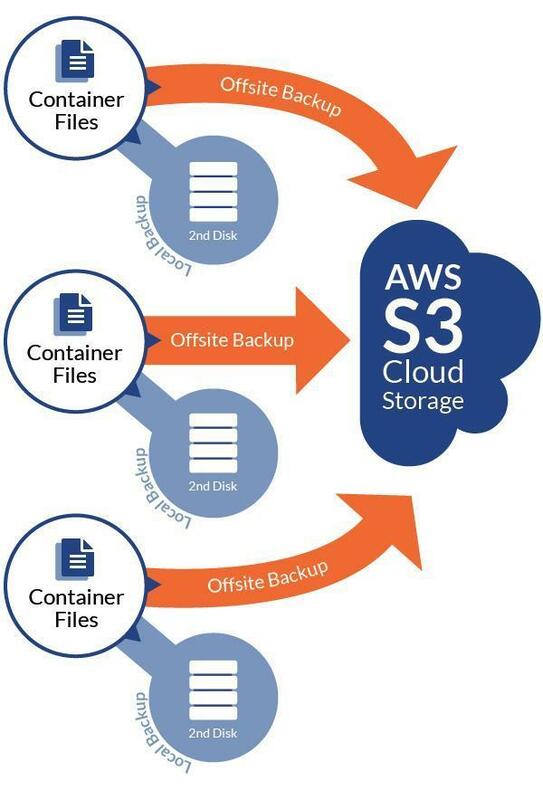 The offsite backup is stored on AWS S3 cloud with an SLA that delivers 99.999999999% durability. Websites requiring an unusually large amount of storage get 1-3 offsite backups per week. Additional backup to a different geographic location is also available. Multi-region hosting with failover is a hardware redundant system designed to eliminate single points of failure. It includes redundant hardware, networking, bandwidth and DNS services. Files are synchronized from a primary location and the database nodes are clustered together. If a region experiences a service interruption, traffic is automatically rerouted. In addition to maximizing uptime, there are other reasons clients chose this configuration. 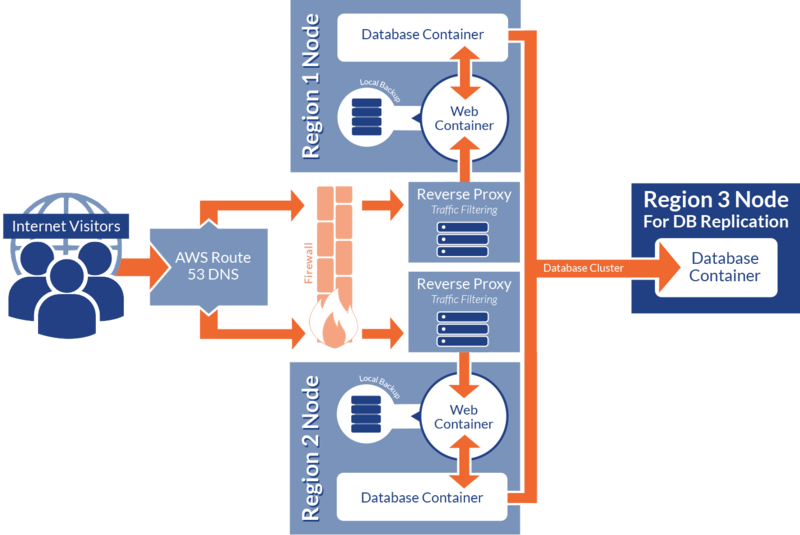 Amazon Web Services (AWS) Route 53 DNS can be configured to direct traffic to the geographic region with the lowest latency. For example, an e-commerce website operates in South Korea and Northern Virginia. Visitors in Asia are directed to the South Korean presence while Europeans are directed to the Northern Virginia region. Businesses requiring the ability to scale up website resources can accomplish this with the multi-region setup. Instead of directing all traffic to one region, you can direct it into other regions. An OpenVZ container with a CentOS 7.x installed operating system. It contains standard packages for web deployment including Apache Web Server, PHP and MySQL. There are two containers per region. The first container is a web server. The second container is a database node. One region is chosen to be the primary. Files are synchronized in real-time from primary region to the secondary region. A program named Lsyncd monitors the file system and creates a batch of changes to transmit to the secondary regions. MySQL Galera is a database cluster system employing a minimum of three nodes. In a standard two-region system, a third region is added to support the third database node. Changes to the database node in one region automatically updates all other database nodes. Galera database cluster is self-healing. An interruption in service of a database node forces a reroute of traffic to another region. In addition to the standard DNS functions of the registrar, Route 53 can detect an interruption in service and reroute all traffic to the other region. In addition, Route 53 will direct visitors to the region with the lowest latency. For example, visitors living in Germany would be directed to a European location while visitors in Ohio would be directed to Northern Virginia. A reverse proxy server blocks traffic from malicious hosts and countries and filters out harmful requests before they reach your website. This is accomplished through the use of Country of Origin Blocking, the Apache Web Server proxy module, Fire Hole I.P. reputation service, and Apache mod_security module. Reverse proxy protection is available for websites that have dedicated and multi-region hosting. The Reverse proxy server blocks several countries it considers bad operators. These countries include Russia, China, Ukraine and Brazil and others. Blocking traffic from these countries reduces the load on your website, making it faster. Clients can opt-out entirely or on a country-by-country basis. Additionally, any specific country can be blocked for your website. FireHole is a community-maintained list of networks and I.P. addresses with poor reputation. This reputation is earned by hosting spammers, botnets or malware. The list is updated every thirty minutes to reflect additions and removals. I.P. addresses and networks on this list are blocked by the reverse proxy server. Mod_security is an open source module for Apache web server. It maintains a battery of thousands of tests ranging from attack-vector detection to malware-upload detection. These are applied in microseconds and do not affect the user experience. Any traffic testing positive is blocked by the reverse proxy. Apache web server is a an open source web server. There are a multitude of add-on modules available for it. To handle traffic forwarding we utilize the mod_proxy module. Mod_proxy is configured to read incoming traffic and forward it to your website. Brain overloaded? Our certified technical experts are here to discuss all aspects of hosting and can help you understand the best configuration for your website. Contact us to learn more.